Product #60782 | SKU 996364005 | 0.0 (no ratings yet) Thanks for your rating! 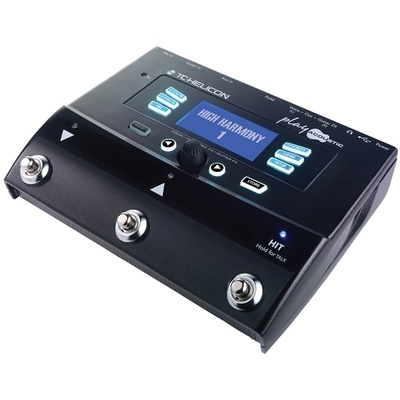 The Play Acoustic from TC-Helicon is a vocal and acoustic guitar effect processor pedal that features dedicated presets geared towards the modern singer-songwriter. The pedal allows you to connect your mic and your guitar at once, and is designed to offer a useful combination of tools for live acoustic performance such as multi-FX, pitch correction, and feedback control. The Play Acoustic offers high-quality vocal effects that can be used in a live or practice setting. These effects include tone controls, vocal harmony, HardTune, reverb, double, delay, μMod, and more. On the guitar side, the unit comes with effect styles from TC Electronic's popular Reverb and Corona Chorus pedals. It features BodyRez AEQ and compression styles optimised for under-saddle piezo pickup acoustic guitars, and also has a narrow notch filter that can be kicked in to tame acoustic guitar feedback.